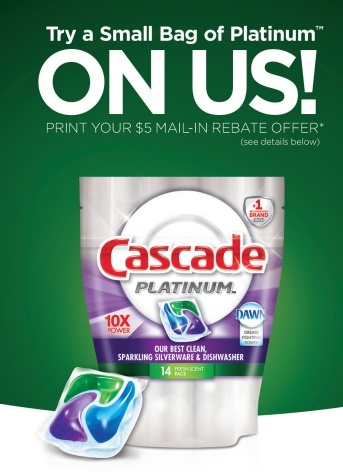 Thanks to WildforWags for the heads up on a $5 rebate when you buy a small bag of Cascade Platinum. The detergent is on sale for $3.99 at Walgreens this week, and there are probably also other places where you can get it for less than $5. At that price, you even make a little money after postage. The rebate is good in the U.S. and runs through the end of the year. You can download it here.